Gillian Reith, 36, runs Three Sisters Bake in Quarriers Village, Renfrewshire, with her siblings Nichola, 34, and Linsey, 31. Having started their careers in office jobs, the sisters decided to take a leap of faith and turn their love of food into a career. Five years later, the savvy bakers now have a second cafe, 50 employees, a cookbook and their own wedding coordinating business. We chat to Gillian about what it takes to leave a high-flying career… and never look back. I had a lovely job. I lived in Ireland and worked in PR and marketing for about four years before moving back to Scotland to work front of house at a cafe in Glasgow. My middle sister Nichola studied chemistry at uni and worked in the pharmaceutical industry as a project manager but she had always baked as a hobby and had started making people’s wedding cakes on the side. Linsey, the youngest, worked in HR for a short while before she took a year out, cheffing in luxury ski resorts and yachts in the south of France. All of us had worked in hospitality jobs through school and university but none of us saw it as a career. For years we’d fantasised about running our own business but I don’t think any of us had any kind of vision as to what that could be like. But soon it became apparent that our skills all aligned and it was obvious that we should run a cafe together. We shared the same interests and our ideas for what we wanted to create were the same. Now we love the creativity and freedom that comes with running our own business. The biggest risk for us was the amount of money that was involved – we’d all been saving as much as we could in that time and for us that was our life savings. In the context of things it was absolutely nothing – we really did start it on a shoestring – but for us, it was a lot of money. Most businesses don’t survive more than a year or two so it was a big risk. We’d been looking in the West End of Glasgow but we couldn’t find anything affordable or big enough so we started looking further afield. Choosing a location outside of the city centre was a huge challenge because it didn’t come with its own footfall. Once we’d picked our spot in Quarriers Village we knew we’d have to drum up word of mouth in order to get people to come. We now have two locations, a cookbook and are responsible for the livelihood of 50 people – things we would never have considered for a minute when we first started. I was always really, really close with my sisters but now we just know each other in a much deeper way. The only thing I wish we’d known was that it was all going to be OK but I suppose we were lucky to be so naive. If we’d known how much hard work would be involved, maybe we wouldn’t have been brave enough to do it! 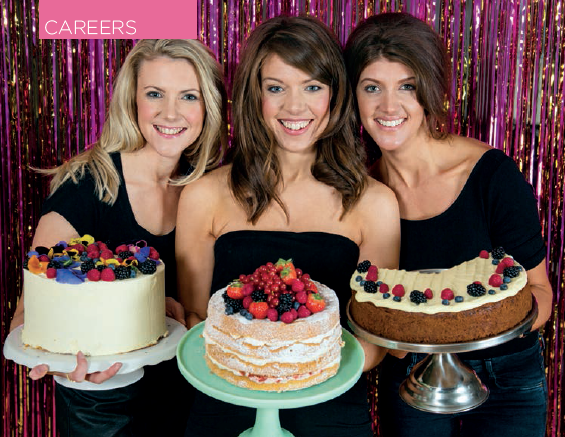 Find out more about Three Sisters Bake at www.threesistersbake.co.uk.